1 - 12' x 12' x 12' Green Sun Shade Sail with D rings. ★Material: HDPE High-density polyethylene, 0% recycled material. ★History of Shade Sail: Ancient Egyptians and later the Greeks and Romans used large pieces of fabric to provide shade. The Colosseum in Rome was shaded with large canvas "sails" pulled into place by Roman sailors. Modern shade sails came into wider use with the invention of a far more durable and relatively inexpensive fabric called shade cloth. Useful versions of shade cloth appeared in the early 1990s especially in Australia and South Africa. For most of the 1990s there was some confusion about what these new devices should be called however they are now most commonly called shade sails throughout Australia, South Africa and the U.S.A. Shade sails have yet to have a significant impact in Europe and South America. ★Current technology: Originally shade fabric, like all fabrics in the outdoors, suffered from UV degradation. UV inhibitors are now added during the manufacture of shade cloth and good shade cloth now generally comes with a multi-year UV degradation warranties. Shade cloth is a knitted fabric and this is an important factor in using it to design and manufacture shade sails.Successful shade sail design uses the inherent "stretch" of the knitted fabric to create three-dimensional shapes. Fabrics other than shade cloth are used to make shade sails such as PVC, a more expensive alternative, or canvas variations. 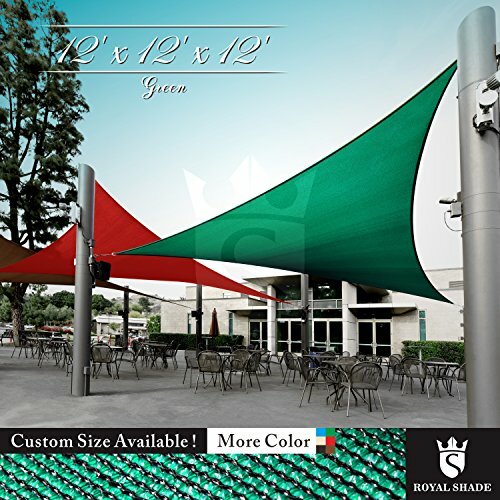 The low cost of shade cloth and its ability to breathe makes it a prime choice for "cool shade"
⚑ Measurement: 12' x 12' x 12', measurement is taken from corner to corner, edges are made slightly curved based on precisely calculated radian, helps shade sail to be tight and neat after installation, prevent shade sail from sagging in the middle for best appearance and performance. If you prefer straight edges please contact us for a custom order. ⚑ Durable Material: Shade sail is made of 100% 190 GSM HDPE (High Density Polyethylene), block up to 95% of harmful UV, woven knitted, breathable fabric allows water and breeze to go through, prevent pooling water and catch less wind. UV inhibitors are now added during the manufacture of shade cloth and good shade cloth now generally comes with a 5 years UV degradation warranties. made to last under sun exposure, resistant to UV, water & fading. ⚑ Stainless D ring and Finished Edges: Edges are finished with heavy duty double layers reinforced stitched seams, prevent frayed edges and keep shade sail in shape, stainless D rings are attached to each corner for easy installation, corners are constructed with extra amount of stitched seams to maximize the strength of D rings. ⚑ How to Choose size & to Install: 1. Approximate how much area you want to shade. 2. Triangle square or rectangle depends on the number of existing poles, can also attach the shade sail with hardware kits to roof, tree, even concrete wall. 3. Use cable wires to connect shade sail to hardware if necessary, if you don't use cable wires, have a 0.5 - 2 ft space between D rings and poles, have some rooms for the hardware kits, comes with adjustable turnbucklesn help to tighten & create tension. ⚑ Warranty: Shade sail comes with 5 years warranty under normal weather condition, your 100% satisfaction is our goal. We recommend to buy with our hardware to maximize the performance and appearance. Why are we so confident? Because we are the manufacturer. If you have any questions about this product by Royal Shade, contact us by completing and submitting the form below. If you are looking for a specif part number, please include it with your message.